Note: the trails around the Klondike and Tibbetts Marsh areas can be a bit confusing, I would suggest bringing this FREE MAP of the area with you on your hike. 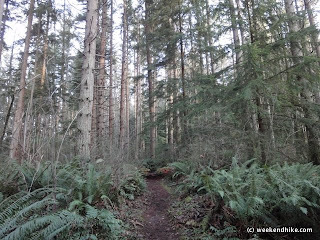 This 5.3 mile hike is a good way to visit the inter-marsh area of Cougar Mountain, if you want some elevation gain (about 1,200 feet gain). It start from the very small (three car) turnout off SR 900. This is the same location as this hike. Green Maps shows the West Tibbetts Creek Trail as an alternate route up the mountain, but this trail seemed a bit overgrown and is not currently marked, instead follow the lone sign showing the way to the Bear Ridge Trail. 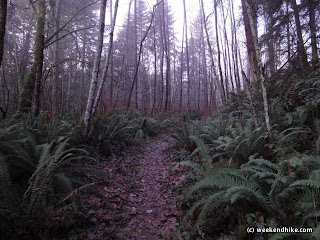 The Bear Ridge trail is not often traveled due to the limited parking, so its a nice mile or so of solitude along a old logging road with feeder creeks running nearby. 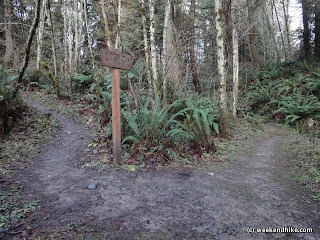 There is a new-ish sign showing a trail off to the right to access the Talus housing development. 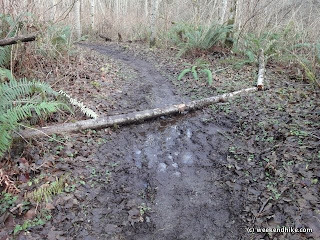 This might hook-up with the old West Tibbetts Creek trail, but I wasnt sure. In any case, continue uphill on the Bear Ridge Trail. Soon you will reach the cool Fantastic Erratic Glacial Boulder, which offers a good view of the terrain below. The trail soon meets with the West Tibbets Creek trail, head Left at this junction to start the loop of the Tibbetts Marsh area. 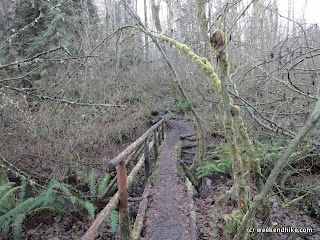 A narrow bridge crosses the West fork of Tibbetts creek. The water on all the creeks was running pretty well during this January weekend, providing for some nice background sounds. The trek continues on the Tibbetts Marsh trail, which is a Left turn. This is a fairly busy area on the weekends so be prepared to see some runners, dogs and fellow hikers. After a quick 0.3 miles, turn Right on the Cougar Pass Trail. 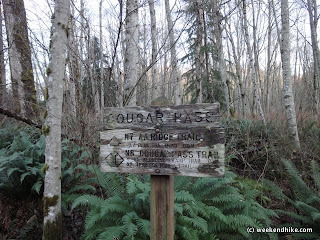 Then after a very quick 0.1 mile, you will reach the "Cougar Pass" area, turn Right on the "AA" Ridge trail (which stands for Anti-Aircraft trail). 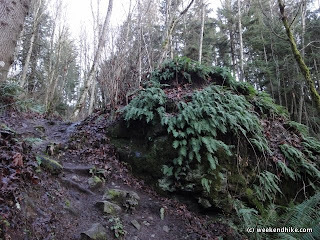 The Anti-Aircraft Ridge Trail is a very "cougar mountain" type of trail. 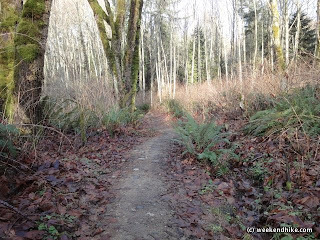 It offers it all: Marshes, Evergreen trees, ferns, some water along the trail and a decent trail surface. The AA trail meets with the Lost Beagle Trail, stay on the AA trail to the Right. After a very shot distance, turn Right on the Tibbetts Marsh Trail. At this point you are very close to the Anti-Aircraft Peak Trailhead. The Tibbetts Marsh trail continues slightly downhill into the Tibbetts Marsh area. 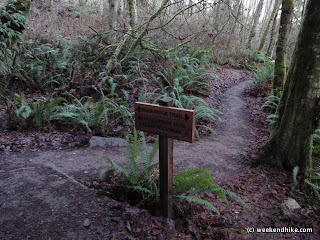 In 2009, we worked with the WTA to improve parts of the trail, it was good to see the drain ditches, and new higher trail are still in great shape. The Tibbetts Marsh trail meets with the West Tibbetts Creek Trail to return you back down the mountain to the start of the hike. A nice 5+ mile hike for those wanting a bit of elevation gain during the winter. 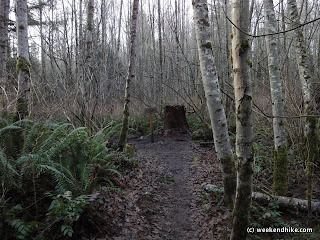 The trails around the Marsh area can be popular but the solitude of the Bear Ridge Trail makes this a nice hike. If you are looking for a more basic hike without much elevation gain, the Tibbetts Marsh Loop can be accessed from the popular Anti-Aircraft Peak Trailhead.